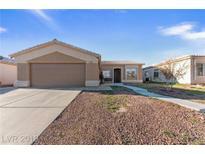 Below you can view all the homes for sale in the Arroyo Grande subdivision located in North Las Vegas Nevada. Listings in Arroyo Grande are updated daily from data we receive from the Las Vegas multiple listing service. To learn more about any of these homes or to receive custom notifications when a new property is listed for sale in Arroyo Grande, give us a call at 702-323-5963. Please inquire about more details, thanks! MLS#2087265. Vegas Homes & Fine Estates. COMPLETELY remodeled single story home**Newly painted 2 tone interior, Engineered laminate wood flooring throughout**White cabinets with stainless hardware, NEW stainless appliances, granite counters**4" baseboards**Stunning view of the mountain range from the backyard**Property backs up to a walking path, no neighbors behind**3 full bedrooms**Two full baths**Two car garage**NO HOA** MLS#2088375. Keller Williams Realty Las Vegas. COMPLETELY remodeled single story home**Newly painted 2 tone interior, Engineered laminate wood flooring throughout**White cabinets with stainless hardware, NEW stainless appliances, granite counters**4" baseboards**Stunning view of the mountain range from the backyard**Property backs up to a walking path, no neighbors behind**3 full bedrooms**Two full baths**Two car garage**NO HOA** MLS#2087946. Keller Williams Realty Las Vegas. Updated bathrooms. Large backyard with desert landscaping. MLS#2080757. Desert Vision Realty. !Landscape w/2 dwarf Lemon Trees+ Fire Pit! 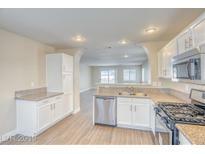 MLS#2077378. Motion Properties. 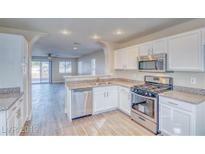 Beautiful 3 Bedrooms 2 Full Bathrooms,Many upgrades,Energy star windows,Security screens,Newer Silestone Kitchen Countertops & Stainless Steel double sink,Newer Whirlpool Stainless Steel Kitchen Package,Replaced a/c Motor,No HOA,Large covered Patio,Easy to Maintain Desert Landscaping. MLS#2070895. Realty ONE Group, Inc.
Great location near shopping, parks and schools. MUST SEE! MLS#2064855. Realty ONE Group, Inc.
Nicely kept lawn in front! 2 Car Garage! MLS#2065489. Wardley Real Estate. Very nice and ready for immediate move in. MLS#2033508. NLV Realty and Management LLC.